Ayesha Curry’s restaurant chain International Smoke isn’t open yet in Houston, but salty Rockets fans — bitter at their team’s loss to Steph Curry and the Golden State Warriors in the NBA playoffs — have already been laying the criticism on thick, giving the restaurant one-star reviews on Yelp. That’s led to a counter-movement of Curry and Warriors fans leaving five-star ratings for the yet-to-open business, and Steph Curry himself is getting onboard. Frankly, he could be a little biased — here’s what Eater SF reviewer Rachel Levin thought of the SF location. Aptly called the Palace of Spices, a giant new Indian buffet restaurant is reportedly opening in the Tenderloin on July 1 (at 173 Eddy). The new business comes from the owner of Inner Sunset restaurant Gorkha Kitchen. Way Outer Sunset cocktail bar/warming hut White Cap, which opened last November, has some new cocktails to try on its second rotating menu. The theme of the zine-style cocktail list from Carlos Yturria is a Garage Sale, and drinks in his ode to spring cleaning include a “Sundress” (Volstead bodka, Suze bitters, watermelon, kaffir lime leaves), a Dart Board (La Vida Mezcal, Pueblo Viejo Añejo Tequila, honey, ginger, lemon) and a “Lava Lamp” a (slushy of Smirnoff vodka, tio pepe fino sherry, aperol, raspberry, lemon). Polk Gulch business Cafe Zitouana (1201 Sutter Street) has reportedly closed. Its building is likely to be demolished in favor of denser housing. Tis the season for holiday merriment and, well, uncorking (and uncapping) bottles of festive wines. Chase some tasty waves with some tasty cocktails at White Cap, one of the newest, chic, utterly unique bars in the Outer Sunset. White Cap seeks to bring an elevated experience to your typical neighborhood bar, all while maintaining all the fun that comes with a corner slushie machine. 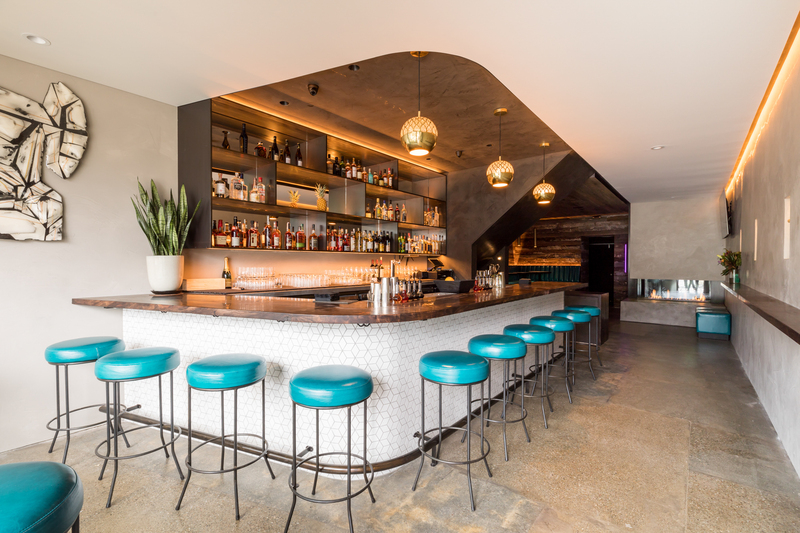 The bar, located just two blocks from Ocean Beach, sits quaintly at the corner of 46th and Taraval where it delights and enchants all those who pass by with an inviting entryway. 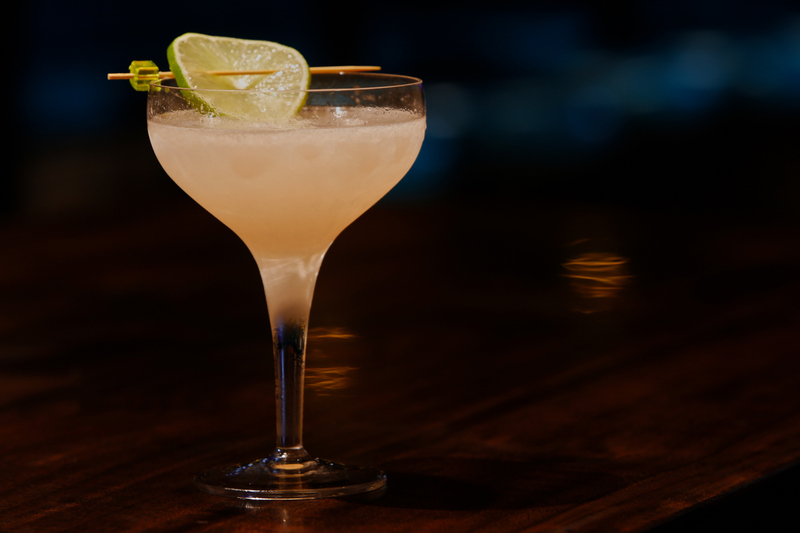 It’s the brainchild of surfer and local Matt Lopez, who envisioned a sophisticated yet relaxed neighborhood bar with outstanding cocktails. 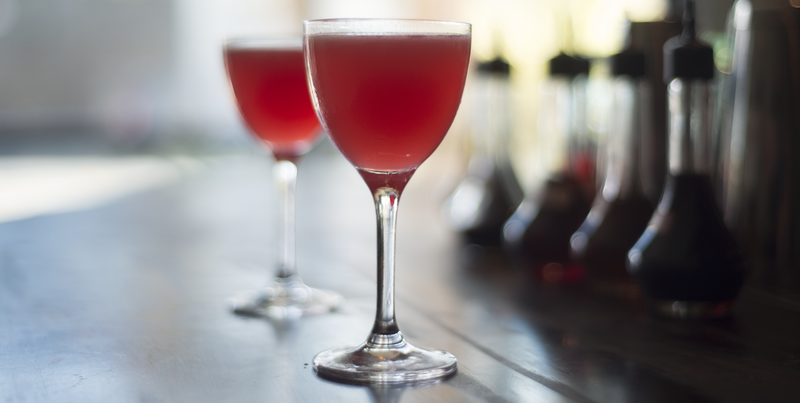 The cocktail list will feature a regular menu plus eight specialty drinks, with quarterly changing themes printed in a collectible fanzine-style book. 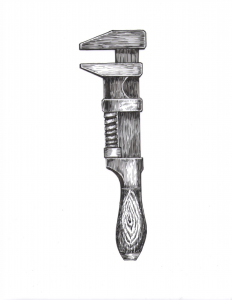 Keep an eye out for drinks with unique names, like the Monkey Wrench, Cat’s Paw and Brush Hammer. Head bartender Carlos Yturria co-owns the FiDi’s Treasury, so expect a smaller translation of his unique Sherry program from the aformetned bar staple. Architect Shane Curnyn of Bar Agricole fame has transformed the interior bar space into an intimate hangout that reflects the Outer Sunset’s reputation as a foggy outpost. The low lighting is meant to mirror the foggy ocean, complete with a blue and white color scheme. A modern jukebox is there to complete the chilled out, grown up vibes. Tubular, gang. Bringing a legit cocktail bar to S.F.’s sleepy Parkside neighborhood along the Pacific Ocean, White Cap invites with a sleek fireplace and reclaimed driftwood walls contrasted by teal banquettes. Surfer and local Matt Lopeza opened the bar at the end of 2017 with surfing pal and drink vet Carlos Yturria, who utilizes his sherry expertise in a sherry section of the menu. 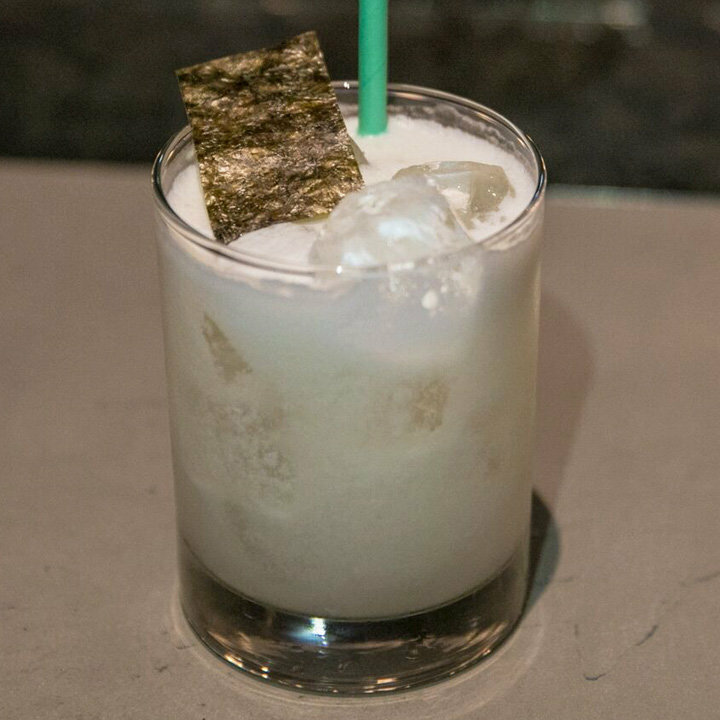 Yturria’s cocktails run both spirituous and light, like the softly creamy Monkey Wrench mixing coconut milk with lime, Havana Club Añejo Clasico rum and a touch of the sea with house-made seaweed syrup and a dried nori (seaweed) garnish. Parkside finally has a real cocktail bar with White Cap, complete with a sleek fireplace, teal booths, repurposed driftwood and surfing competitions on the TV. The sherry expert and beach bum Carlos Yturria crafts the cocktail menu, with drinks like the inspired screwdriver with manzanilla sherry. 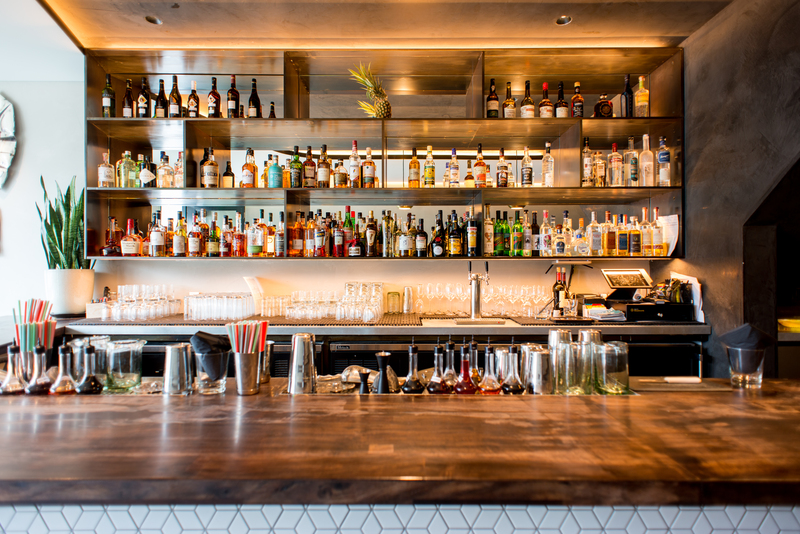 Much like Lower Pac Heights needed a cool new bar, so did the Outer Sunset. And apparently the surfers agreed because now, just a block and a half from Ocean Beach, there’s White Cap, a cozy bar that feels much more grown up than you’d expect from a couple of guys who make it a point to paddle out as often as they can. Grab a seat at the bar, which feels as light and bright as a bar in the foggy Outer Sunset can, or—if you’re craving cozy—head to the seating area in the back where you’ll find walls covered with dark, reclaimed wood, turquoise leather banquettes, and the best thing of all: a modern fireplace. As far as drinks go, there are eight specialty cocktails ($12) that will rotate seasonally, a small sherry program, as well as a decent selection of beer and wines by the glass. The service is friendly, the vibe is laid back, and if you live anywhere around White Cap, you’ll probably find yourself there often. But even if you don’t, it’s worth a trip out to the beach. Maybe dip your toes in the water while you’re there and remind yourself of why you live in SF in the first place. A new cocktail bar has opened in Parkside. 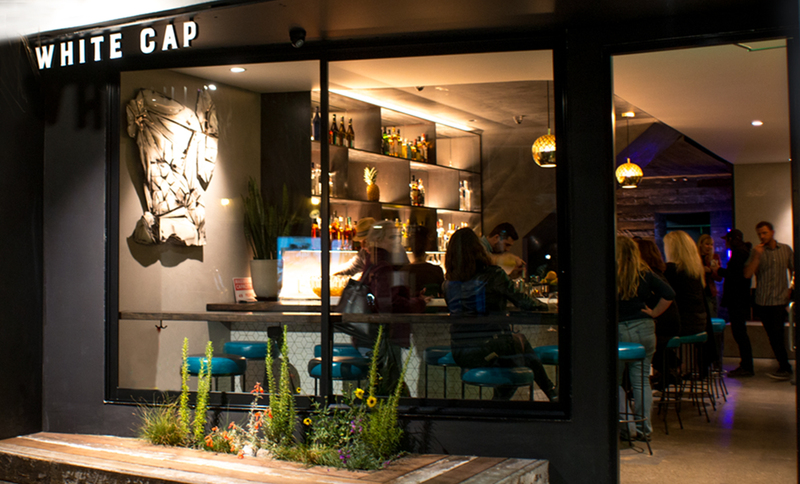 Called White Cap, the newcomer is located at 3608 Taraval St. (between 46th & 47th Aves.). Just two blocks from the beach, the new spot is the creation of neighborhood resident Matt Lopez and Carlos Yturria, who bartends at The Treasury. The tool-themed menu of signature cocktails specializes in plays on traditional standbys, like a slushy “Monkey Wrench” with anejo rum, coconut, seaweed, and lime; and a “Screwdriver” with Volstead vodka, Tio Pepe fino sherry, and orange juice. 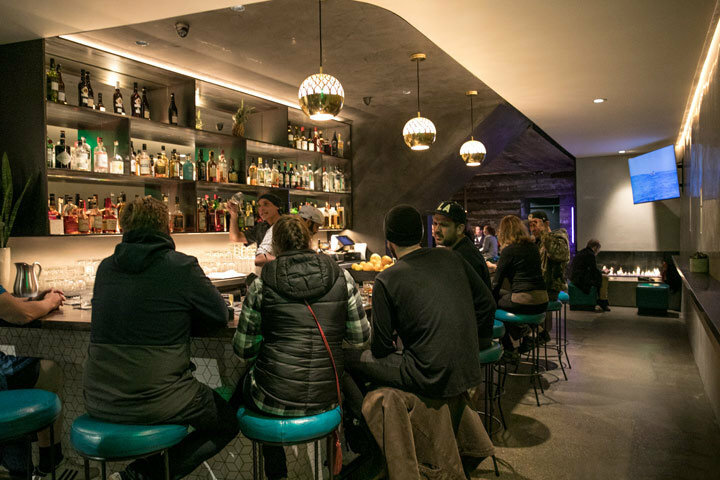 The small bar (it clocks in at only 500 square feet) has a hip but weathered look, with lots of concrete, reclaimed wood, and retro finishes. For now, the menu is cocktails only, with no food. With a five-star rating out of two reviews on Yelp so far, the new cocktail bar is on its way to developing a local fan base. 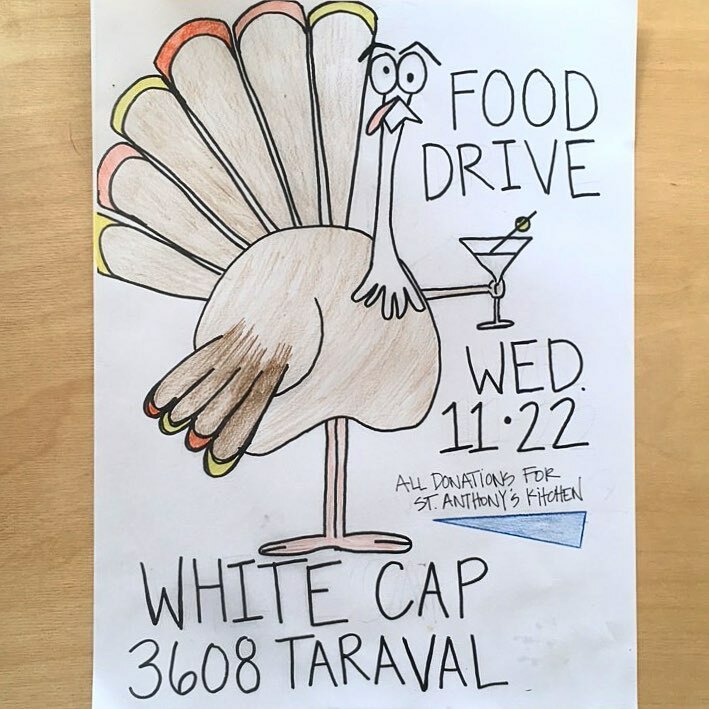 Tomorrow night, White Cap is holding a Thanksgiving food drive; drop off donations of canned food to enter a raffle for a White Cap gift certificate. All donations will be dropped off at St. Anthony’s Kitchen. Intrigued? Stop in to try it for yourself. White Cap is open daily from 2pm–2am. A new bar project is coming to the Outer Sunset, ~WHITE CAP~, due to open Friday November 10th. Partners Matt Lopez and Carlos Yturria (both surfers) teamed up to create an elevated spot to grab a drink, but it will be less of a sandy surfer hangout and more of a “grown-up” neighborhood bar with well-made cocktails—even though it will be just two blocks from the beach. There will be a regular menu plus eight specialty drinks and changing themes each quarter. Also look for sherries chosen by Yturria and a slushie machine. Shane Curnyn (who did Bar Agricole) is behind the design, which features an L-shaped bar and banquettes. Open daily 2pm-2am. 3608 Taraval St. at 46th St.